Our African Lakes Exhibit recently got a makeover! The exhibit still includes Lake Malawi (commonly called Lake Nyasa), Lake Tanganyika and Lake Victoria, but we added a section that includes the endangered or threatened cichlids found only in the lakes and streams of Madagascar. 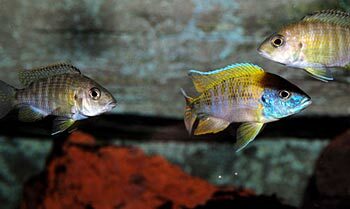 Cichlids from Madagascar are very primitive and they appear to be similar to fossil fish, dating back to the age of the dinosaurs. Our Madagascar section includes the spotted damba and the polleni cichlid. We also introduced many other new species to our collection including the electric blue ahli and the sunshine peacock to the Lake Malawi section. Tiny shell dwelling shellie cichlids, sardine cichlids and Tanganyikan killifish can be seen in the Lake Tanganyika section. 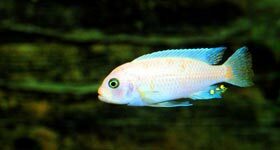 For our Lake Victoria section, the Milwaukee County Zoo is proud to be participating in the Lake Victoria Cichlid Species Survival Plan, overseen by the Association of Zoos and Aquariums, which helps preserve the degeni cichlids, believed to be extinct in their natural habitat. We’ve also added the striking, multi-colored nyererei, originally from the Python Island of Lake Victoria. Our makeover included replacement of all plastic plants, filters, pumps and rocks. The renovation is a slow process, since all of the new fish must stay in quarantine for 30 days before their introduction to the aquarium, and we’re still adding new species, but the renovation was 98% complete July 4. Visit the African Lakes Exhibit in the Aquatic and Reptile Center.